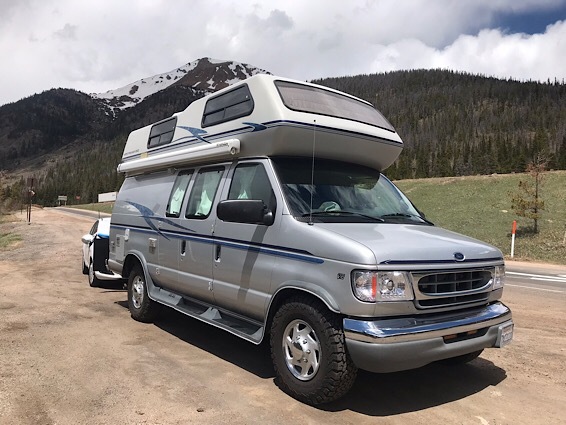 Purchased in 2017 during our search for a motorhome that could safely take us cross-country, camp in any of the National Parks, pull into a normal-sized parking spot and be able to store on our driveway, we discovered this gem. We spent an entire year renovating it from top to bottom. Much of the work was completed by Premier Motorcoach Innovations, a Santa Ana company and leader in their field. An extensive list of the renovations follows. Needless to say, this B190 is not a “project.” It’ll be worth your while to read everything here and look at the pictures to see why we consider this B190 to be one of the world’s best. 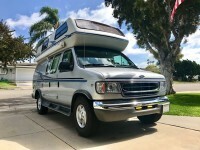 1999 Airstream B190 on Ford E350 Chassis – 180,799 miles; 30,799 on new engine. •We were dissatisfied with the couch. With the back up, it was too narrow as a single bed. With the backdown, it was uncomfortable as a double bed. 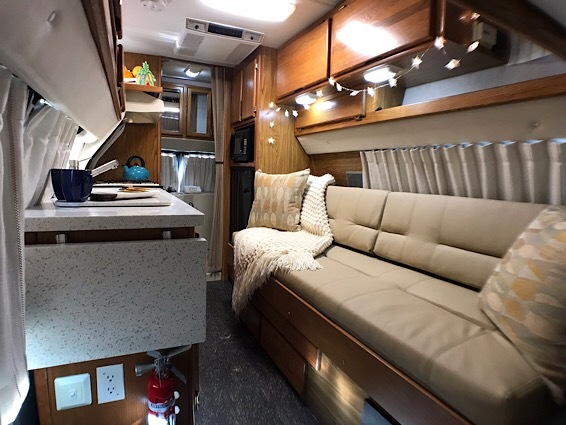 We added a sliding tray, and custom ultra-leather cushions to create a functional and comfortable 72”x46” gaucho bed that easily slides out to transform the couch into a luxurious bed for one or for two. With the sliding queen bed in the loft, this motorhome can easily sleep 2 adults and 3 kids, with seatbelts for everyone! 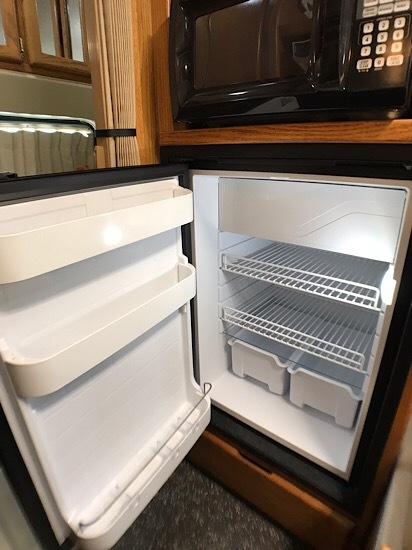 •The old absorption refrigerator was replaced with a new 2018 marine grade residential Vitrifrigo C130RBD4-F 4.7cf AC/DC refrigerator/freezer w/external compressor (which does not need to be level to operate and eliminates any fire hazard). •Replaced the old carpet and pad with a new subfloor and a Roppe commercial-duty rubber tile floor. •Custom-made drapery with blackout liners were installed. 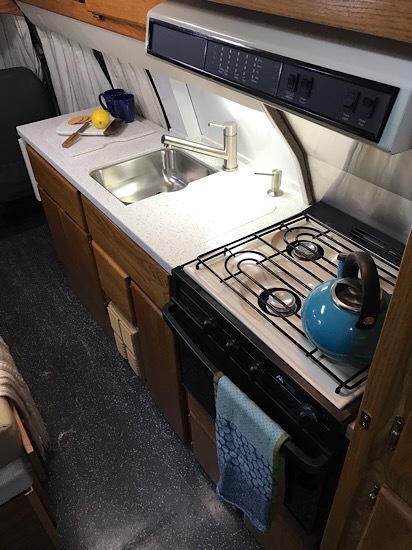 •New Corian countertop with 1′ flip-up shelf galley extension (also Corian), new 5” deep, double bowl sink, one handle faucet with pull-out sprayer and built-in countertop soap dispenser. 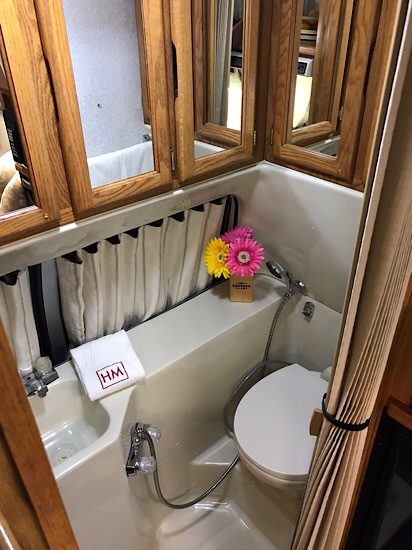 •Custom-made screen for back lavatory window added. •Replaced sun-bleached cabinet wood and installed boxed storage area in closet. 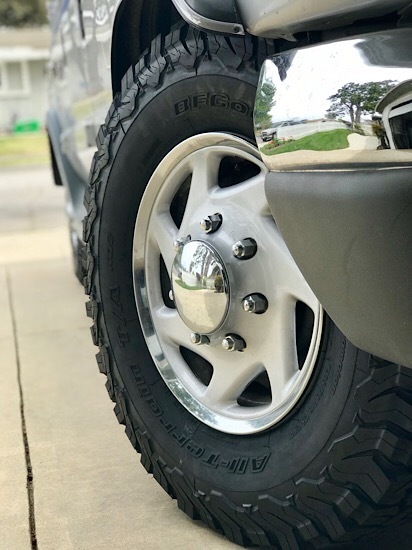 •A new set of original Ford wheel covers. •Advanced HID headlights and integrated signal housings, all chrome with: Morimoto H1 7.0 Projectors, Orbit Shrouds, Acme 5000k bulbs, Fast Bright 55w ballasts, & 9007 bi-xenon relay harness. •Installed a garmin backup camera and a front bumper clearance camera. •Included adapters for 50 and 20 amp hookups. •Blue Sea Systems dual USB 4.8A socket mount charger with intelligent device recognition maximizes charge rate for phones, tablets, or other mobile devices, mounted in dash. •Replaced 10 spark plugs and 10 ignition coils. Average mileage, towing a small car, improved from 9.6 to 10.9 mpg. •Includes a Gen-turi generator exhaust system that muffles generator sound and sends fumes above the roofline — works great! 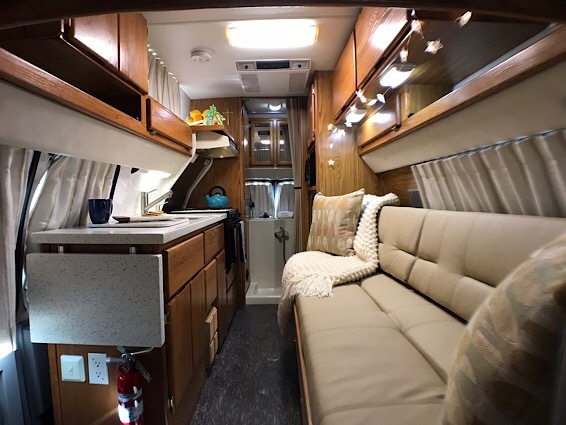 Due to the overwhelming demand for a capable class B motorhome in a smaller, more nimble 19 foot package, in 2018 Airstream brought back a newer incarnation of the B190 that sells for over $160,000.00! 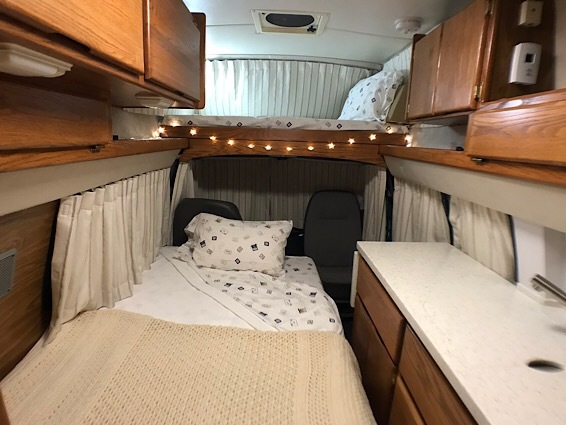 And it doesn’t even have the cab-over queen bed! 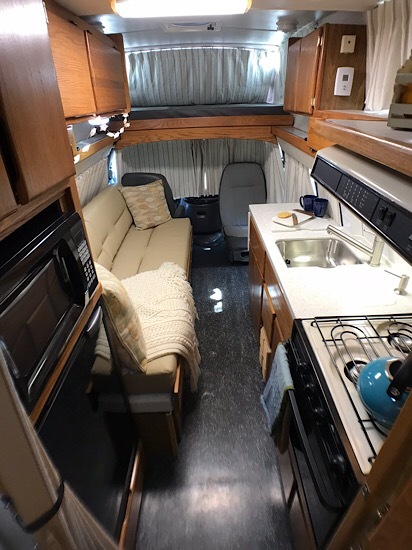 Save yourself a ton of cash and check out our fully restored 1999 Airstream B190. We’ve lost track of some of the costs along the way, but we’ve got receipts for at least $54,000. We’ll consider any offer in that neighborhood.